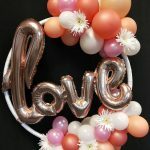 When you are looking to maximize the decorating budget for a corporate event, birthday party or any special occasion, balloon décor is a great choice. Decorative balloons are the perfect way to liven up the festivities, and our helium balloons can be customised to fit any company’s branding or theme. We love working with our clients to make exciting, memorable balloon decorations, so call us today! Below are several ways to use our balloons at your next corporate event. 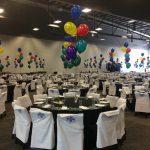 With balloon centerpieces, you can turn a plain ballroom, banquet room, or meeting room into an engaging, inviting, and welcoming event space. Our air-filled, helium-filled, latex, and foil balloons range in colour scheme and size from sophisticated and elegant to fun and festive. Use corporate branding on our printed helium balloons, or work with us to develop displays that perfectly match the theme of your event. No matter what you choose, your balloon display is sure to be unique and memorable. 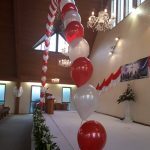 Balloon columns are very versatile, as they can be made in a range of designs and shapes. A well-crafted balloon column creates an atmosphere inside your event venue, allowing you to make the space your own. When placed on both sides of a buffet table, they’ll tell guests where to go for refreshments and appetizers. If they’re set up in the entryway, they’re a great way to call attention to a point of interest. 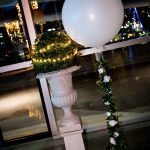 Whether you’re sponsoring a themed party or you just want to liven up the event venue, use our intricate, elegant balloon columns to add flair and colour. as. If you’re hosting games during your company party, consider using one of our balloon arches to tell attendees where these events will take place. An arch made of foil or helium balloons makes a great entrance decoration for a wedding or corporate event. 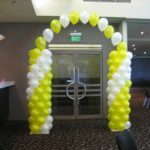 For instance, if you’re hosting an event at an out-of-the-way venue, consider placing a balloon arch out front to bring guests’ attention to points of entry. With painting and other interactive balloon activities, you can have your party décor serve a dual purpose. This budget-friendly, colourful, and simple activity is a great icebreaker or team-building effort for corporate networking events. 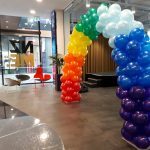 Additionally, these colourful latex balloons will work as statement-making art pieces that add a splash of vibrancy to any boring event space. Are you looking for a way to add glitz and glamour to your event venue? Wrap helium balloons in tissue, lace, or gauzy fabric for a classy, yet budget-friendly look. 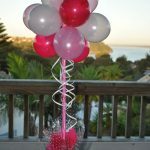 Or, you can ask our experts how to create glittery balloon garlands and other decorations. If, like most company owners, you’re working with a small budget, use our iridescent balloons in assorted colours to create a customised balloon wall. We’ll blow them up in various sizes and affix them to the wall in artistic patterns. Ask us about our printed balloons for additional corporate branding possibilities! Although our brightly coloured helium balloons look very festive as they float through the venue, some guests may find them obtrusive. Avoid the hassle and inconvenience by making unique, imaginative stationary décor. Ask our team how to use coloured latex or foil balloons in place of flowers for a pretty, festive display. 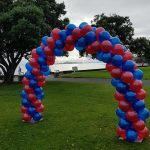 Rather than adding more clutter to dining and food service tables, refreshment stands, and bars, tie business cards, photos, and other corporate branding materials to our helium balloons and float them above the festivities. This not only creates a more enchanting look, it helps keep the venue from looking messy. These are just some ways you can use our foil and helium balloons at your next event, and we invite our customers to get creative and move far beyond our standard décor designs. We will team up with you to develop a balloon display that works with your party’s theme, your company’s brand, the season, or all these factors. Our talented, creative balloon display experts will customise your display to fit your design goals, no matter the scale. Visit our site or call us today to get started on creating the ideal decorations for your next corporate event.